TOTAL last minute party. Decided on some favorites of mine that would also be kind of easy to make Sunday AM. #1 is a dip I had at a cooking class called Bubbles and Bites. It was actually already made when we arrived for the class (so I’ve never tried making it) and we got the recipe to try at home. I did change it a bit for me (noted). This is my first time not just using Lipton for my sour cream dip! Heat a large skillet over low-medium heat. Add the olive oil. When it shimmers, add the shallots, cover and cook for 10 minutes and then add balsamic vinegar and salt. Continue to cook (covered) until the shallots are deep golden brown in color, stirring to make sure not burning, about 20 minutes or so. Let cool. 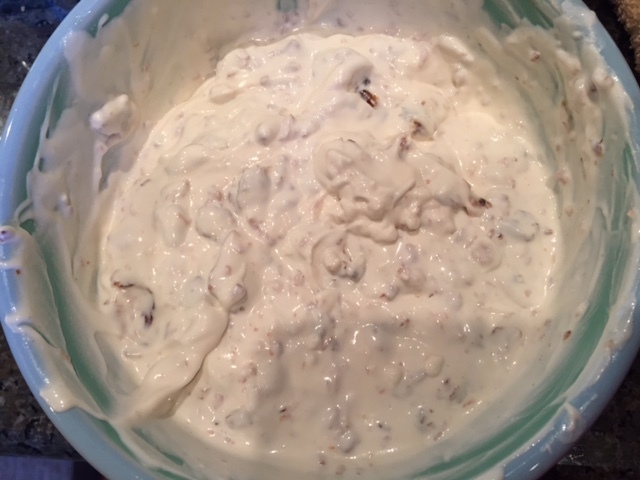 Whisk together the mayonnaise and sour cream in a medium bowl to blend. Add shallots and bacon. Season dip to taste with salt and pepper.